Yapmo is an office collaboration tool that can especially benefit real estate agencies. Some agents may be prone to resisting adoption, so an email integration feature enables outside communication to funnel into the system. Brokers would be smart to encourage full adoption to avoid disparate use, even among part-time or half-interested agents. Most people are not good at managing their email. There are countless plug-ins and extensions and strategies out there to help reach the Xanadu that is “inbox zero.” If those who you collaborate with most often don’t leverage similar tactics, it’s quite challenging to maintain your journey. Just ask Sisyphus. Chicago-based Yapmo is attempting to put everyone on the same playing field by eliminating inter-office email altogether. So far, the boulder has been pushed to the top, and it’s staying put. 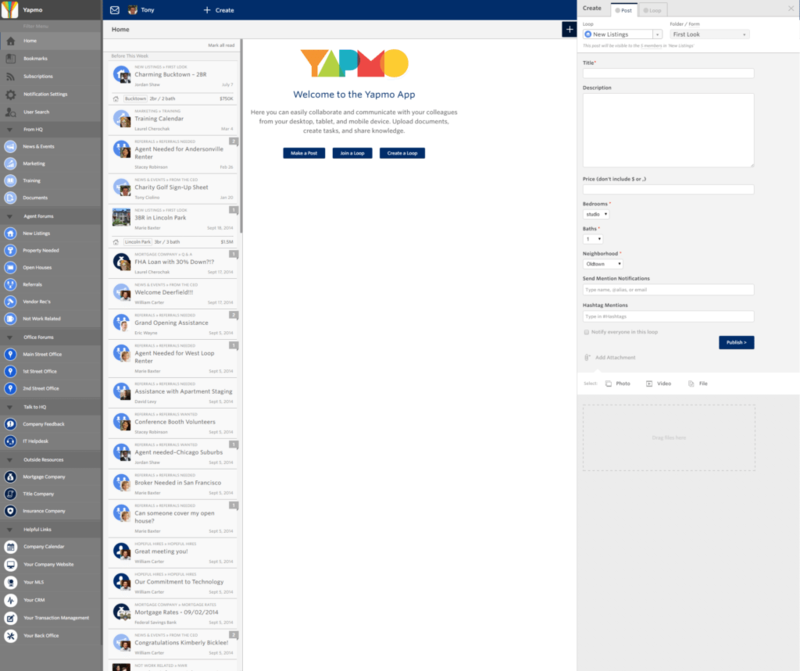 Yapmo visually categorizes office discussions, called “loops,” using an interface that resembles most email clients. So it’s easy to use. Clicking on one of the left-hand column’s discussion topics opens its content on to a dashboard, along with tools to comment and interact. Each loop is assigned a set of access privileges upon creation. The Rivers, Gates & Associates Team may not see the loops created by the Brady-Belichick Home Team. However, members of each can contribute to the Upcoming Training Events loop. Which the latter squad would certainly record and re-sell as their own. The basic Yapmo concept isn’t complicated. However, its developers have added a few sharp value adds to perpetuate the efficiencies of a single internal discussion platform. 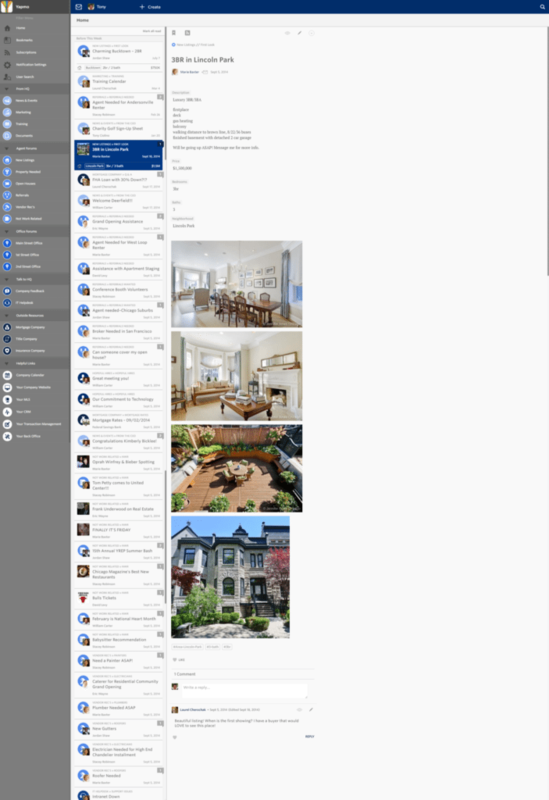 A simple text and image form builder allows agents to create a basic listing sheet. By adding rudimentary data, such as an address, beds, baths, size, construction type, Yapmo builds structure around a internal data. I wouldn’t over-use these external alerts, they only defeat the purpose. When compounded by multiple agents using the same form and Yapmo’s “every word is a keyword” search intelligence, an internal MLS can be built. A light version, anyway. Users can exercise control over what loops they’re a part of by subscribing and choosing to be alerted via their external email when a loop is active. If a person responds via that alert, the comment becomes a part of the Yapmo thread. I wouldn’t over-use these external alerts; they only defeat the purpose. 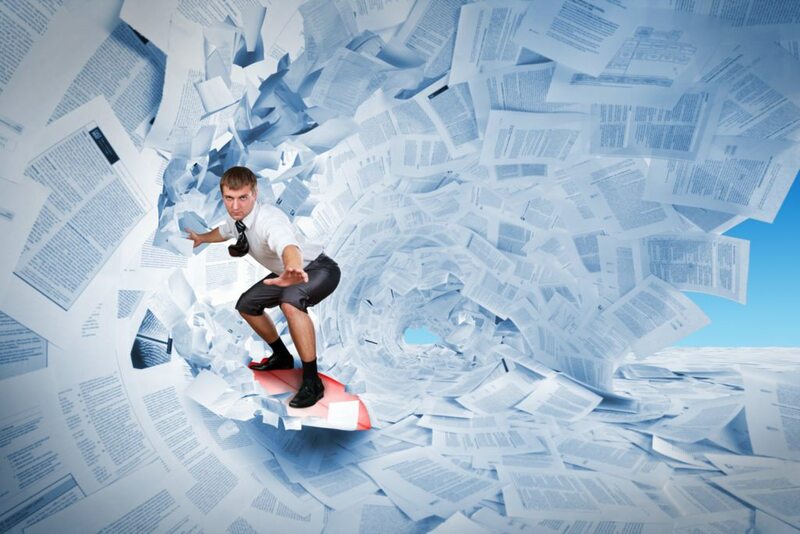 Rich content can be added to each loop, such as images and video, as well as attachments like Word docs and PDFs. Brokers can measure agent activity within the software to the loop level and view geographic heat maps when users are spread across town, or the country. Yapmo is completely white labeled from head-to-toe. It’s app is fully connected to browser activity, so branded loops go everywhere agents go. Iframing is a programming tactic that embeds HTML content into a web page, or another HTML file. Yapmo uses it to drop any number of popular software tools into its dashboard. Yapmo is completely white labeled from head-to-toe. 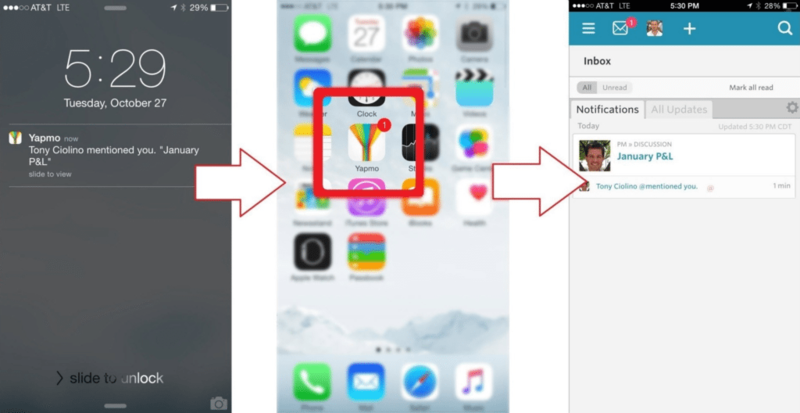 This would allow your CRM and email marketing tools can be accessed via a single icon within Yapmo. An entire office of tech tools can be centered around its primary vehicle of communication, helping listings, transaction data and marketing tactics remain a part of the conversations that drive them. Not every company allows their software to be iframed, but many do. Nevertheless, that’s not reason to avoid investigating what Yapmo can offer. Calling Yapmo an intranet would be somewhat shortsighted. Yapmo is emulating communication interface tactics similar to many social media tools. Its design empowers, not just facilitates, conversation among colleagues, something brokers should firmly encourage within their operations, should remaining relevant in our on-demand, share-all economy be a priority. Pending upgrades will better integrate external messaging relative to specific loops, namely those having to do with listings. This means clients and vendors can be assigned access privileges to loops. This seems like a natural evolution of the software, but it also inches it toward project, or transaction, management. And that means tasks, and document creation and workflow design. Maybe I’m jumping the gun. I hope the guys at Yapmo at least talk about it first.